Shares of ZTE, which dropped 70 per cent as it got caught up in the US-China trade war, are back in favour with traders. China’s second-largest telecoms gear maker has jumped 45 per cent since the second quarter on the Shenzhen exchange, making it the best-performing stock on the CSI 300 Index of big caps. Its Hong Kong-traded stock has advanced 22 per cent in that period. The turnaround in ZTE’s share performance, which tumbled to a near four-year low last month, came after the Trump Administration lifted a ban on selling key American technology components to the Chinese company. The latest catalyst fuelling the rally is China’s progress in building its fifth-generation wireless network, allocating spectrum bands to major mobile operators. The stock was also added to MSCI’s emerging-markets index in the latest review this month. 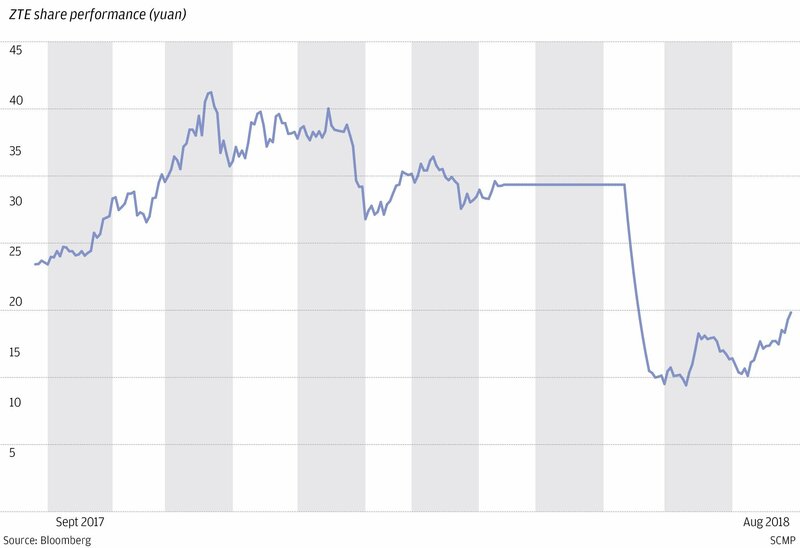 ZTE had a traumatic month in July, slumping by the 10 per cent daily limit for eight consecutive days and wiping out 69 billion yuan (US$10.1 billion) in market value, as the US embargo had virtually left it in a state of being out of business. The Chinese company finally paid US$1.4 billion in fines to settle the dispute, putting it back on track. It was able to resume normal operations and retain 75,000 workers. ZTE stands to benefit the most from the launch of the 5G networks because of its edge in the technology and costs over rivals, according to Sinolink Securities. The company’s global market share will probably increase to more than 20 per cent from the current 12 per cent in the 5G era, said Tang Chuan, an analyst at the brokerage. ZTE rose by 3 per cent to 18.95 yuan in Shenzhen on Tuesday, paring its losses to 48 per cent this year. The stock slipped 1.5 per cent to HK$14.60 in Hong Kong, heading for a 50 per cent decline in 2018. The consensus view on the stock is still bearish. ZTE’s mainland-traded shares have a 12-month price target of 17.21 yuan, implying a 9.2 per cent drop from its last closing price, according to 19 analysts covered by Bloomberg data. The percentage of analysts who rate the stock as “sell” was the highest since April, the data showed. ZTE will probably post a half-year loss of as much as 9 billion yuan, widening losses of 5.4 billion yuan in the first quarter, because of halted business operations and fines paid to the US government, according to exchange filings. The interim results are due on Thursday.